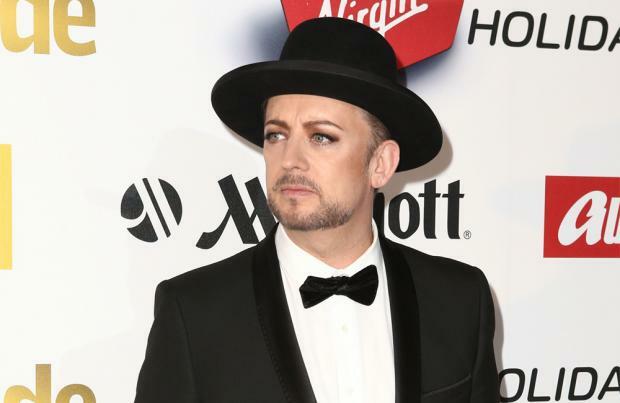 Boy George says Culture Club's first video in 20 years is trying to "turn protesting on its head". The British band have unveiled the inspiring new promo for their single 'Let Somebody Love You' - the first track from the band's highly anticipated new album 'LIFE', their first studio release in 20 years - and the 57-year-old singer wants his fans to understand that positive thought is the new anger when it comes to society. Speaking in video from behind the scenes of the video shoot, he said: "Well the video is a celebration of protesting but it's like turning protesting on its head. Rather than protesting and complaining, we're gonna be angry but in a productive way so the idea for the video for 'Let Somebody Love You' is to say why don't you actually talk about things you love than talk about things you hate. Go and hold up a banner that says something really positive, tweet that talk about music that excites you don't talk about things you don't like cos you kind of give it oxygen." The director of the video, Howard Greenhalgh, reveals that Boy George was the brains behind the promo - and that working with the band was like hanging out with "mates down the pub". He said: "The idea for this came from a phone call with George and he got talking about speaker's corner so it's quite simple we said let's do speakers corner like you've never seen speakers corner. That's it that's just the arc of it form George arriving there setting up his little talking point, like a magnet he draws everybody in and then even stuff that we never planned is happening. These guys are great it's just like your mates down the pub you feel like you've known them for ages and George and the boys they're talking to all the people and I think that that's really created a great vibe so it certainly makes my job a hell of a lot easier." Culture Club's album 'LIFE' is released on October 26.